Phew, what a day. Last night it started pouring like crazy. I went to bed fairly early, since I had to get up today at 6 AM for work, and I was praying that it wouldn’t be raining. I woke up to the sound of rain, and hoping that it still wasn’t time to get up yet, looked at my phone to see the time. I was happy to see 4:54, since that meant I still had an hour to sleep, and the rain could maybe stop by then. When I finally did get up, the rain had stopped and I was very happy. I still bundled up though, in my big jacket and my rain boots, and brought my umbrella along, too. I realized that I had dressed in bleak colors today (navy blues and grays), but figured it went along well with what I thought would be a dreary day. When I got off work, the sun had started to peek through the clouds, so I decided to bike back home to change. It was nice to come home to Christiney Weeny in my living room. She spent the night last night again since it was storming and I didn’t feel like venturing out into the storm to take her home lol. Spent the rest of the morning at home with Shea and Christine before going to my first class. I changed, washed some dishes, and ate the rest of my raw broccoli. I really like raw broccoli. Yum. 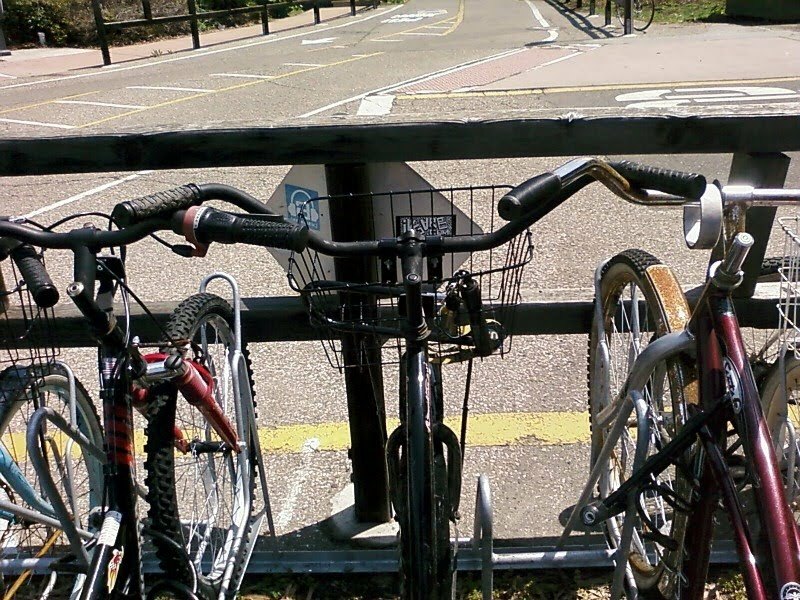 When I came out to my bike after my class, I noticed the way the two other bikes had parked along side of me and it made me think of three friends, with the friend in the middle putting his/her arms on his/her friends’ shoulders. Haha, yeah I’m weird. And tired. Today has been a long day, and it’s still not over yet. Bible study girls should be here any minute. That’ll be nice. But once that’s done, it’ll be straight to bed for me so that I can get up again at 6 AM tomorrow for some more work. I like waking up early though because I feel so accomplished. I’m just glad I don’t have to do it everyday, haha. haha that picture is soooo funny!